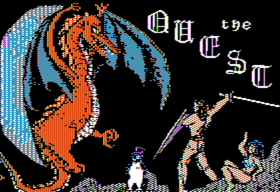 The Quest is a text adventure developed by Dallas Snell and published by Penguin Software in 1983. In 1984, it was re-published for many other systems. One of the two main characters is Gorn, the barbarian champion that will later become a recurring character in the Ultima series. 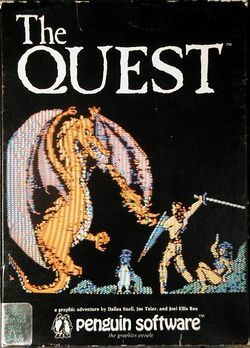 A sequel was published in 1985, titled Ring Quest. Portrait of author Dallas Snell, used in Ultima 6 to represent his own character. Our story is of a time long ago, and a place far away. A tale of kings and knights and sorcerors and dragons. A tale that is never repeated no matter how often it is told. A tale that you, my friend, shall determine how is to unfold. Your story begins in the kingdom of Balema. King Galt has granted an audience to a young noblewoman from a southwestern province. The king is seated upon the throne, his favorite mistress by his side. Gorn, the king's champion, lounges arrogantly by the king's other side. Being a mere advisor (and a new one at that), you take your place among the other court nobles and listen with interest to the discussion in progress. KING: "Rise, Lady Diana, you can talk much better without the palace floor marring your knees. You were saying?" DIANA: "Please forgive my people, Milord, for it is not their fault they cannot pay their taxes this season! Our land lay in ruin, our harvests burned, our villages ravaged!" KING: "And just what is the cause of all this calamity?" DIANA: "A dragon, Milord! A demon-spawned nightmare from the depths of hell! Please, Milord, my people can hardly feed themselves! I offer myself in exchange for mercy upon them!" KING: "Begone with you, Lady Diana, back to your poeple. I need you not. And tell your people that Gorn, the king's champion, will soon be on his way to rid my kingdom of this hell-bred thorn!" After saying this, King Galt turns and hands Gorn a bag of gold. KING: "Take this gold and outfit yourself for the Quest. And take yon new advisor. Heed his wor closely, he comes with the highest recommendations. Now be off!" The player takes the role of the king's new advisor, and he travels together with Gorn, the king's muscular champion. The game proceeds by typing commands that Gorn will execute. The text parser allows to input rather complex commands, such as "use flint and light lantern". This page was last edited on 2 December 2018, at 15:43.